If you have adopted a Lovebug, please make sure your microchip is registered and up to date. The first step is to have your dogs microchipped scanned by your vet. Verify that the chip number scanned matches the chip number on the adoption paperwork in your adoption folder. Lovebugs Rescue registers ALL AVID microchips for the life of your pet. If you have an AVID chip, please call them at:1.800.336.2843 and make sure your chip is registered with the correct information. If your dog has a Home Again chip, or other type of chip, please contact the microchip company directly to register the chip. While microchips are a great back up, please make sure your dog is wearing an ID tag with your current phone number on it. If your dog should get lost, that is the quickest way your dog can be reunited with you! A microchip implant is a small identifying integrated circuit that is about the size of a large grain of rice. It is injected by syringe under the skin of the animal, usually in the back between the shoulder blades for dogs and cats. 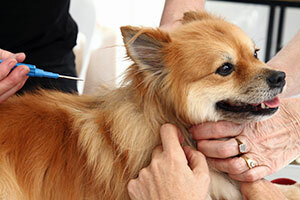 Microchips can be implanted by a veterinarian or at a shelter. Why is it important my chip is registered? Unfortunately, there is no universal database that exists for microchip registration. There are various microchip implant companies that each have their own database for registered microchips. The majority of our Lovebugs are implanted with an AVID microchip. The microchip is only activated when scanned; it does not track the animal. So if a dog is lost, it must be taken to a vet to be checked for the presence of a microchip and once scanned the person that is listed under the microchip can be contacted and the dog can be returned to its owner. If you adopt a dog with a pre-existing chip, owners need to contact the company to make sure the microchip is registered under their contact instead of the previous owners.